Solidarity to Paranesti detention center immigrants’ hunger strike! Free all detained immigrants now! On Sunday March 29, a solidarity action took place outside Paranesti detention center, where detained immigrants started a hunger strike on Monday March 23, 2015. More than 290 undocumented immigrants (amongst them 80 minors) are detained in Paranesti. They lack medical care. Right now 23 sans-papiers are on hunger strike. 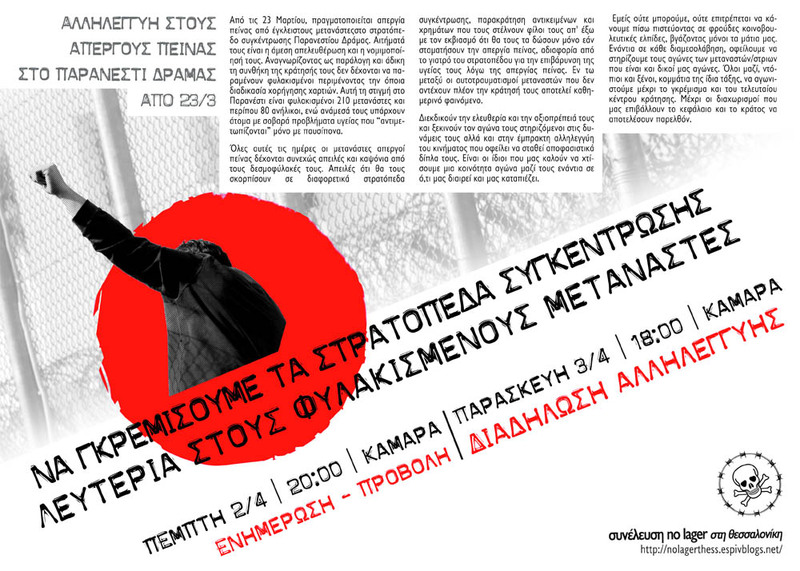 Hunger strike in ‪‎Korinthos‬ concentration camps started by 300 immigrants‬ and ‪‎refugees‬ in ‪‎Greece‬! Inhuman conditions, insufficient nutrition and dirt. Nine immigrants from Romania were kept as slaves in a village in Peloponnese. Bosses kept them imprisoned and unpaid under the thread of a gun and forced them to work for 19 hours, while they had to sleep among the animals. Some escaped and revealed the story. I am sitting next to Walid Talb. He is a very gentle and shy man. He smiles a lot and is willing to answer any question I throw at him; about his life in Egypt and then about what happened three years ago. I am not a journalist, you see, so I cannot keep up with the flow of a proper interview. Every time he refers to a detail of what they did to him in Salamina, I get a sudden, almost instinctive urge to change the subject, to get out of the café and get a breath of fresh air. I admire him for his courage. Walid Talb is seating next to me; his hat, his smile, his very existence act as a series of reminders. Let us briefly qualify the statement that “undocumented immigrants entering Greece will not be arrested, but they will be handed a paper giving them one month to leave Greece”. Earlier today some government decisions concerning undocumented immigrants were released. All immigrants being kept in detention centers for more than 6 months will gradually be released. Then, they will be given a paper postponing deportation for a 6-months period. In this period they should leave Greece by themselves. Undocumented immigrants crossing greek borders will no more be arrested, but (as in the past) they will be given a paper saying that they have one month to leave Greece. If they get arrested after this one-month period, they will also be given a paper postponing deportation for 6 more months. 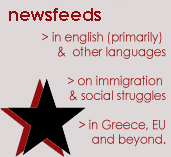 Then they will enter an uncertain status, as the immigrants’ situation in Greece had (has) been for many years. Most of the detention centers will not close – perhaps not even Amygdaleza. So we almost return to the situation as it was 3 years ago. Not exactly. 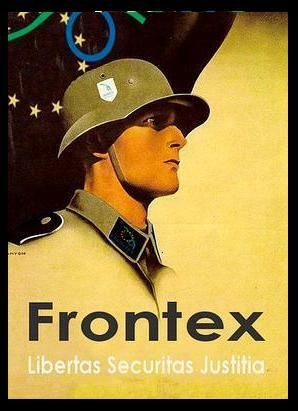 Back then maximum detention was three months, not six, there were seven detention centers less, the nazi party percentage was 0,15%, not 7% and the immigrant population was much bigger – actually during last three years the total population of Greece has decreased, for the first time since the formation of the greek state. And the police keeps chasing immigrants street vendors. 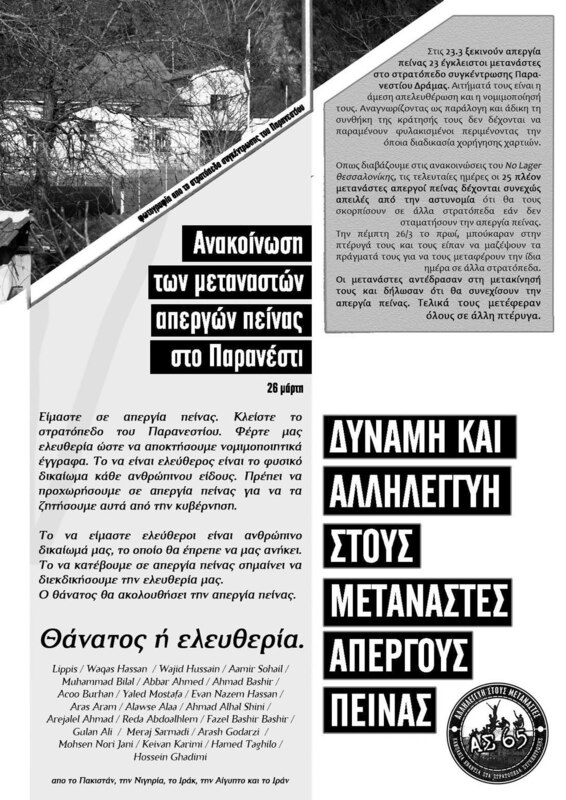 So we are far away from the recent far-right governance of Greece (especially the anti-immigrant peak of summer 2012 to autumn of 2013), but we are also far away from February 2011, when Syriza MPs were supporting the 300 immigrants’ hunger strike for immigrants’ legalization. No time to rest for the movement. UPDATE: Government does not confirm that undocumented immigrants entering Greece will not be arrested. They say that it is false information leaked by the opposition party. P.S. 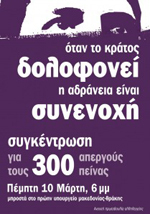 : As far as the statement that “undocumented immigrants entering Greece will not be arrested, but they will be handed a paper giving them one month to leave Greece”, well this was more or less the common practice until three years ago. Undocumented immigrants arrested at the borders were kept in police custody for three days for medical examinations and then were released with the one-month-to-leave paper in their hands. Those who were applying for asylum were kept in detention centers for up to 3 months, as a form of punishment, in order to discourage people from applying for asylum. Very few were granted asylum, very few were deported, some were occasionally arrested, all undocumented were facing police repression and all were trapped in Greece and controlled by smuggling mafias.